This is a creamy stir fried beef strips cooked with all-purpose cream. Very easy to cook and the ingredients are few and very easy to find. In fact you can cook this in any occasions. As much as possible, thinly sliced beef sirloin is recommended in cooking this dish but you can substitute it with other parts of the beef that is not tough. Pounding the meat will help if the beef you bought is tough cut or use tenderizers instead. To cook beef steak ala crema: Rub beef with Maggi Magic Sarap and liquid seasoning. Marinate for at least 20 minutes. Heat oil and sauté onions for 2 minutes or until crisp tender, then set aside. In the same pan add marinated beef and pan fry until brown. Add fried onions. Pour in Nestle all Purpose Cream and simmer for 5 minutes. Remove from heat and serve immediately. Garnish with parsley if you like. For a complete list of ingredients with exact measurements continue reading. 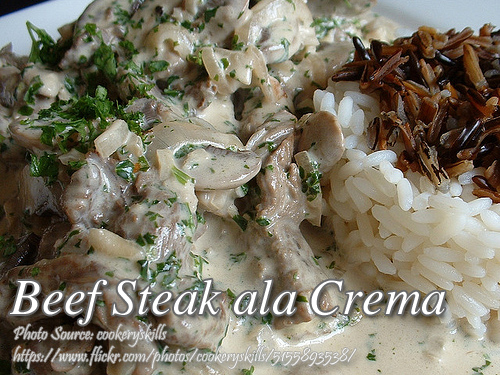 This is a creamy stir fried beef strips cooked with all-purpose cream. Very easy to cook and the ingredients are few and very easy to find. Rub beef with Maggi Magic Sarap and liquid seasoning. Marinate for at least 20 minutes. Heat oil and sauté onions for 2 minutes or until crisp tender, then set aside. In the same pan add marinated beef and pan fry until brown. Add fried onions. Pour in Nestle all Purpose Cream and simmer for 5 minutes. Remove from heat and serve immediately. Garnish with parsley if you like. Just exactly, i will cook tonight creamy beef with broccoli for family dinner. First time to try that’s why feeling excited the outcome. Thanks for the info. Hi Maricel Bulasa, I’m very happy that you like the recipe. Thank you very much for the rating! Hi. Okay lang po ba lagyan to ng mushroom in can? Di mag iiba lasa? Pls i need ur reply. Thanks. Hi NIÑA, ok lang po lagyan nag mushrooms in can.